Welcome to the Daily Starter, your daily Kickstarter nugget of information, highlighting projects we deem worthy of your time, attention, and support. 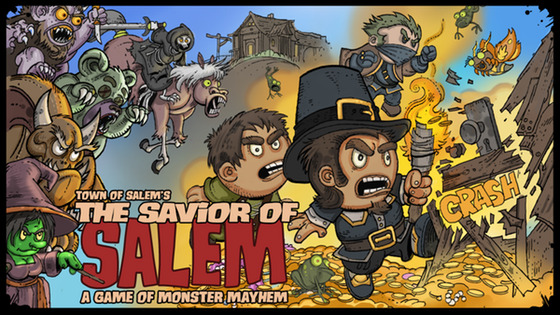 Coming in as a second Kickstarter campaign for the Town of Salem card game universe, the first of which was successfully funded, Savior of Salem deals away with its predecessor’s Mafia/Werewolf mechanisms and takes a further step into the world it depicts. Players, loyal Townspeople, work towards defeating the Coven in this one, whilst acting as scummy as possible to one another at the right time. After all, it’s all about being the one to actually reach the victory condition first in order to be anointed town hero! This idea has been paraded around the cardgaming world before (Cutthroat Caverns sends its regards), but we don’t have enough of it around to feel like it’s overused just yet. And with the folks at BlankMediaGames getting the artwork just right, i.e. marrying the “cutesy” ghibli style with personality and charm for each character/being depicted therein, we feel like this can be a light-mid complexity hit with many a gaming group. And did we mention the attractive price point and bonus digital rewards for it?